When there are neither visible oppressors nor victims, and where memory of historical suffering has grown remote, freedom becomes subtle, banal, and finally, elusive. To call attention to its flight amidst pervasive prosperity is a thankless undertaking. Most who embark on such a venture have not chosen it. They have been driven to it, by vivid confrontation with the residues of historic oppression, by encounters with victims and oppressors, who are, after all, produced even in times of prosperity and peace as well as war, and finally, by recognition of the repressiveness of everyday life, a recognition they cannot dispel in spite of potency of common sense, most especially the belief in the existence and importance of social harmony. The unnerving quality of these lines makes itself present in Jeffrey Paul Bayliss’ On the Margins of Empire - Buraku and Korean Identity in Prewar and Wartime Japan, the subject of this review. Unlike Norma’s book, which deals with a Japan in the midst of a psychologically-redefining, collective upheaval following the death of the Showa Emperor in 1989, Bayliss’ book approaches a Japan at the turn of the twentieth century, when the country found itself in the throes of an unrelenting and successful pursuit of Western industrial technologies, vital requisites for its own militaristic and imperialistic aims. The bulk of Bayliss’ monumental archival research deals with the periods of time mentioned in the title, specifically the late Meiji period (1868-1912), the Taishō period (1912-1926) and the prewar and interwar Shōwa period (1926-1945). The political, social and economic traumas of this interval and their importance in the historical formation of a modern Japan cannot be overstated but they have been tackled more extensively by other writers. In this book, Bayliss is concerned with the sophistications of the relationship between Korean and Buraku minorities under the auspices of violent modernization, failed attempts at a democratic process and the militarization of all aspects of life, to mention just a few of the major overhauls of the social order during the scramble to create Dai Nippon Teikoku (‘the Great Empire of Japan’). For those with more than just a casual interest in modern Japan, the once widely held notion of it as a remarkably homogenous, socially harmonious nation has been exposed as a historically contracted and carefully maintained fiction - one that conceals a diversity of groups of various ethnic and social backgrounds in order to deny their claims to membership in the nation and facilitate discrimination and exploitation. 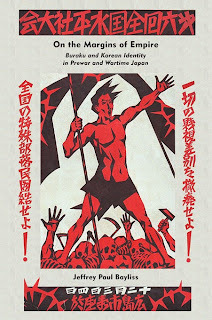 Bayliss’ book, as the title aptly reveals, examines the history of the Burakumin and the Koreans and the formation of their identities from victims of a protracted discriminating social order that has its roots in Japanese antiquity to militant activists in a hostile modern environment afflicted by war and repression. For these social categories their oppressors are visible, intolerance is a constant living reality and freedom is not only a distant panacea but, in Japan of the Taishō and early Shōwa years, it is also a dangerous, even criminal, object of interest. There are many injustices portrayed in this book but Bayliss’ main aim is not to compile a catalogue of historical proofs for an acrimonious audience. His main purpose (at which he excels) is to draw on a voluminous assortment of primary and secondary resources to construct an almost complete overview of the development of Buraku and Korean identities. These two distinctive groups on the margins of Japanese society progressively converge, influence each other and eventually break apart in their mutual pursuit of recognition, tolerance and equality. The cultural, social and political realities behind the convergence and the split dominate the pages of the book. Bayliss’ choice to investigate these two minorities together, in a comparative manner, is nothing short of exciting, if not necessary, especially in light of the extensive research on single-minority focus which dominates the scholarly field. As the author points out, the Burakumin and the Koreans shared not only a long history of discrimination and exploitation, but they also lived together in the same communities and often worked in the same industries. As I read through, there was no doubt in my mind that, despite their many differences, contradictory allegiances and distinct identities, the Burakumin and the Koreans had their points of contact. The book is organized around seven chapters. To perform an individual analysis of each chapter is counterintuitive as the material covered by Bayliss is too compelling and sweeping; moreover, the author himself summarizes each chapter in his Introduction. I will instead focus on a few interesting historical points described in the book. Chapter One takes a detailed look at the origins and evolution of discriminatory attitudes towards Koreans and Burakumin beginning with the Edo period (1603-1868) and continuing through the Meiji period (1868-1912). In order to exercise greater control over all the social strata of a newly-unified country, the Tokugawa government instituted policies that made outcaste status hereditary and legally bound. It is noteworthy to mention that a class of outcaste people (senmin or ‘unclean people’) existed even before the Edo period and it included such groups as the eta (‘much filth’) and the hinin (‘un-human’). Members of the senmin underclass undoubtedly lead a desolate existence ripe with exploitation and segregation but the Tokugawa government gave them defined roles and functions in the society (such as skinning animals, making leather, collecting and removing human waste and corpses) and these were protected and preserved by decree. Despite their prominent role, the senmin were almost virtually absent from accounts handed down by Edo period scholars — in sharp contrast to the Meiji intelligentsia who, in its attempts to build a nationalistic, all-inclusive notion of what it meant to be 'Japanese,' never ceased to hypothesize on the hereditary origins of the Burakumin, fostering more discrimination and exclusion throughout their findings and debates. Another contrast to the Meiji period was the Tokugawa high regard of Korean culture, a consideration which began to wane with the appearance of kokugaku (national studies) scholars in late Edo period. From hereon and continuing beyond the Meiji period, the general view of Koreans as inferior was exemplified (and amplified) by Japanese Prime-Minister Itō Hirobumi’s assertion that a ‘subservient way of thinking’ (jidai shisō) was an inherent and causative factor to the general economic and cultural stagnation of the Korean peninsula (an evaluation that gave rise to the much-accepted teitairon or ‘stagnation theory’ among Japanese historians of that era). Bayliss does a comprehensive job of tracing the hardening of this view among Japanese nationals from mythological origins (in the Nihon Shoki and Kojiki) to social Darwinian discussions characteristic of the post-industrialized capitalist ethos which flourished in Japan at the time. All of this was happening in the backdrop of a vitalized consolidation of the nation-state centering on the emperor as a symbol of national and racial unity (a process which coalesced in the notion of kokutai). Most revealing of this first chapter are the condescending and disparaging views towards the Korean and Buraku minorities by important literary figures, scholars and dignitaries such as Fukuzawa Yukichi, Katō Hiroyuki, Nitobe Inazō, Kita Sadakichi and Shibukawa Genji, to mention a few famous ones. Later it became apparent that these views were part of a more elaborate strategy to build a national identity lacking any visible imperfections or impurities, and to stage the foundations of a modern Japanese empire. The divergent paths taken by each group were not simply the result of choosing which nation one ‘naturally’ belonged to, but came about as each formed different answers to the same fundamental problem: how to restore and maintain a sense of pride and self-worth within a society that denied human dignity to those it imagined as irredeemably different from the majority. An important part of this effort was to convert everyone, including minorities, into loyal, cooperative subjects who would contribute to the war effort and not be a burden to the state in its time of unprecedented crisis. The human dimension of ‘total mobilizaiton’ was in essence a renewed emphasis on the old slogan of ikkun banmin [‘one ruler, many people’], the idea of one familial nation, with the emperor as father and the subjects as his children. …whether it was buraku women and Korean men marrying in the wake of the Pacific War, Suiheisha organizers and Korean residents of Higashi Shichijō reaching out to one another in the wake of the flood… or even buraku landlords who were willing to stick up for their Korean tenants in the face of community opposition, these acts by individuals of both minorities revealed a peculiar kind of mutual understanding and trust, born of the shared experience of living at the ostracized margins of Japanese society. There is more to say about Bayliss’ detailed exploration of Suiheisha (a political organization founded in 1920 to fight against discrimination and defend the interests of the Burakumin until it was forced to disband in 1940); the financial and political successes of a small number of memorable and exceptional individuals among the outcastes and Koreans; the displacement of minorities or ‘unwanted elements’ to the remote regions of Manchuria in order to facilitate the state’s imperialistic expansion; the influence of leftist thought and the dynamics of proletarian organization which gave minorities the necessary ideological apparatus and the courage to demand equality in the face of classist adversity. All of these items get their own interesting chapter: nothing that can be written here can match the grand scope and sharp narrative of the book. This was the dilemma that had plagued these minorities since the late Meiji period: assimilation was no guarantee of acceptance. Only when the majority no longer had any recognition of difference, past or present, could these minorities be accepted as equals. This unforgiving logic was as true for minority individuals as it was for the groups with which they bore an association. For burakumin and Koreans in Japan during the age of empire, it meant a place on the margins, regardless of whether they conceived of liberation from discrimination in terms of complete acceptance by the majority or complete freedom from association with it. Bayliss, Jeffrey Paul. On the Margins of Empire: Buraku and Korean Identity in Prewar and Wartime Japan. Harvard University Asia Center, 2013. Field, Norma. In the Realm of a Dying Emperor. Random House LLC, 2011.